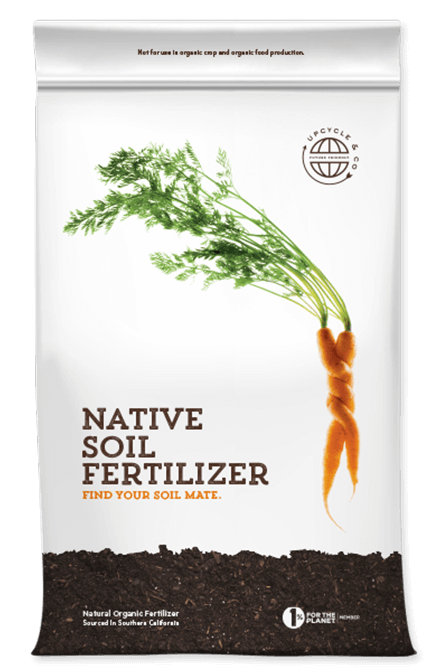 Native Soil is a sustainable natural fertilizer made of naturally sourced organic matter. By the locals, for the locals, we collect our upcycled ingredients from nearby areas and sell it in neighborhood nurseries. We recognize a greater balance must exist between humans, animals, plants and soil. What we take from the earth must be returned to the earth. We gather leftover nutrients discarded by humans and return them to the soil to grow more food. Every bag is upcycled with a conscience and brimming with eagerness to grow tasty and bountiful crops. We’re hell-bent on perfection when it comes to purity, pH, nutrient density and composting quality of our non-chemical soil builder. So whether you’re an upcycling newbie or a composting junkie, you can feel good knowing every scoop is solid. Doing it Locally Means Doing it Right. Native Soil is a local fertilizer. That’s important because conventional fertilizer companies mine their nutrients from tens of thousands of miles away. And we have a big problem with that. Our minimal pollution process saves the environment and feeds your family by locally sourcing and preparing nutrients naturally. We don’t steal from the earth. We don’t ship from far away. We do it right because we believe it’s the right thing to do. We’re not certified organic. And that is on purpose. Native Soil is a natural fertilizer. We think that’s better than being certified organic. Because organic isn’t always better. Did you know there are over 20 chemicals permitted for use in growing and processing organic crops? In some cases, organic farming requires up to 20x more fungicides per acre than conventional farming. All those extra chemicals mean more runoff and more environmental pollution. This doesn’t sit well with us. We want to save the environment and feed your family by locally sourcing and preparing nutrients just like they did in the old days. We upcycle natural, organic matter that would otherwise fill up a landfill. Then we sell it to you, your local nursery and local farms.